Joe Sasfy, who created Time-Life’s 50-album, 1, 100 song, Rock 'n' Roll Era series some years ago, emailed me in connection with my March 13 blog entry, in which I discussed Art Laboe’s Oldies But Goodies series of compilation albums. I’m quite sure that Time-Life’s Rock 'n' Roll Era is the biggest and biggest-selling oldies series of all time. Mr. Sasfy reports that Time-Life has just inked a deal with Art Laboe and will issue a new, 10-CD collection titled The Ultimate Oldies But Goodies Collection, to be sold primarily as an infomercial. The host of the infomercial will be Bowzer (Jon Bauman, pictured) of the group Sha Na Na. Readers are invited to review my earlier blog entry, in which I linked Art Laboe and the Mothers of Invention album Cruising With Ruben & the Jets (1968) to the formation of Sha Na Na in the late 60s, an “oldies” act that very early in its performing history appeared, somewhat improbably, at the Woodstock Festival (August 1969). Like many people did, I first saw Sha Na Na in Warner Brother’s documentary of the Woodstock Festival, Woodstock (1970), performing "At the Hop." 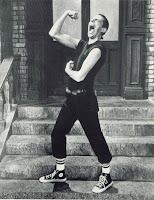 For some reason, although my parents primarily listened to swing music, they always seemed for some reason to have on Sha Na Na’s television variety show (1977-81) at the appropriate time--episodes of which, surprisingly, have never appeared on DVD. During those same years, in 1978, Sha Na Na appeared in the hugely successful motion picture version of the musical Grease, under the name of Johnny Casino and the Gamblers; their songs can be heard on that movie’s very popular soundtrack. The group still performs to this day. Regarding the Ultimate Oldies But Goodies Collection, Mr. Sasfy says, “You might say that, as we teeter here at the edge of rock ‘n’ roll history, all the remaining players in the oldies 'game' have joined together for one last un-ironic nostalgia fest.” I have written Mr. Sasfy asking him to keep me posted regarding the availability of the forthcoming Ultimate Oldies But Goodies Collection; I will let you know as soon as I hear something.